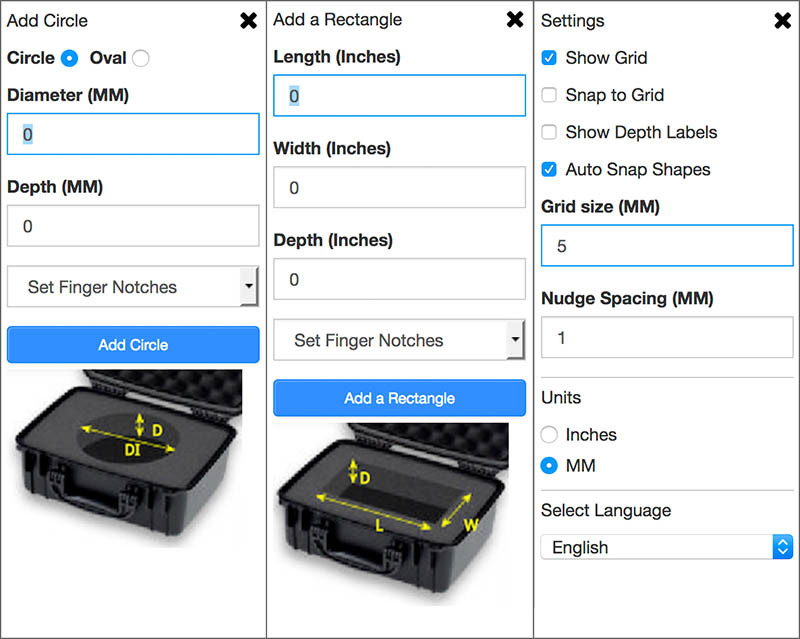 The MyCaseBuilder.com online app offers basic tools for creating cutout profiles based on simple shapes – circle/oval, rectangle, and line drawing. The design process involves 1) measuring each item, 2) constructing a cutout profile (diameter, length, width, depth), and 3) placing the cutout profile on the design app grid. I selected a grid with 5mm Grid size and 1mm Nudge Spacing. 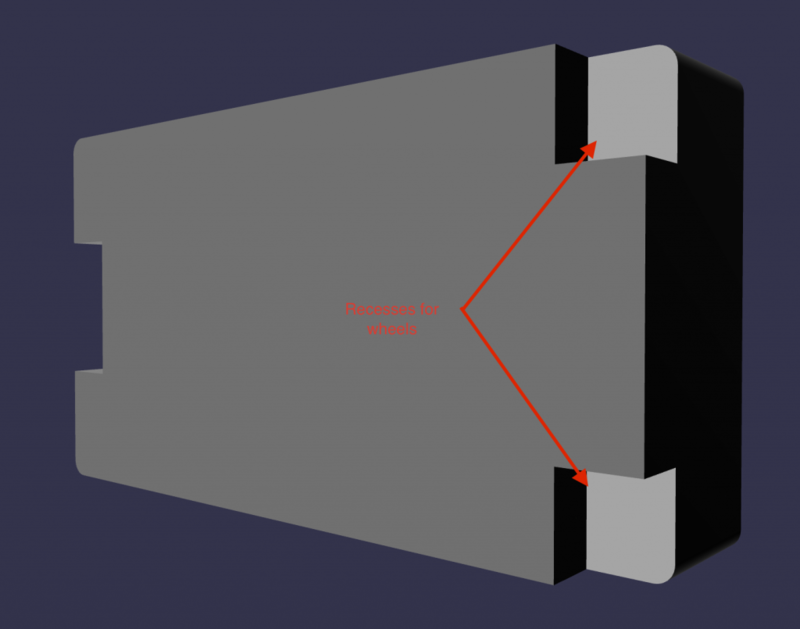 Nudge Spacing is useful for precisely moving the cutout profile horizontally or vertically. I also found that selecting Auto Snap Shapes was useful in positioning cutouts that I wanted to have aligned with each other. While many camera and lens profiles are in the MyCaseBuilder public and private libraries, they didn’t have anything that matched my Hasselblad gear. So I started from scratch. 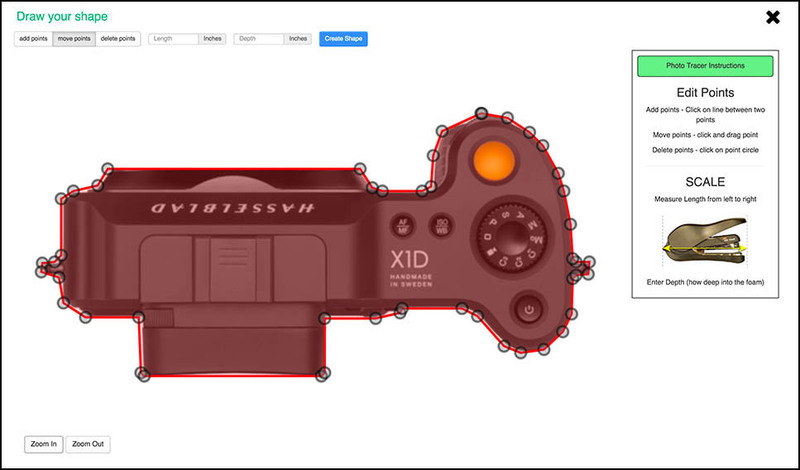 For the camera body, I used their online Photo Tracer tool and a top-down photo of the Hasselblad X1D camera body. The Photo Tracer tool works best with a photo that has been taken using a white background. It also helps to have a dark or black object and/or to adjust the contrast in Photoshop to achieve the highest contrast possible between the object and the background. For the lenses with hoods attached, I assembled a set of concentric circles with accurately measured diameters and depths. 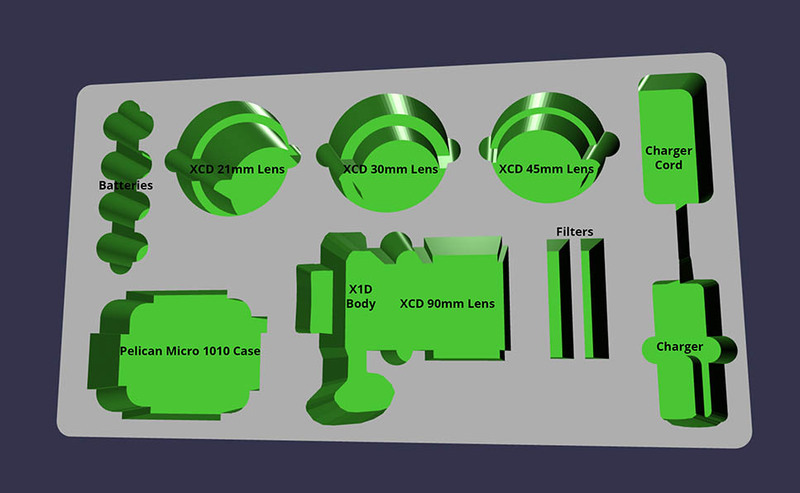 I designed the insert so that lenses could be inserted vertically to best utilize the available foam real estate. 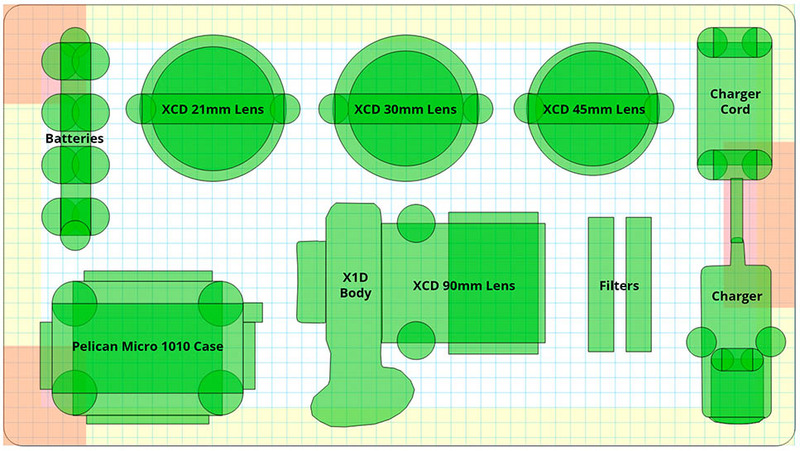 My most used lens, the XCD 90mm, is incorporated in the design mounted to the camera body. The small plastic Pelican Micro 1010 case holds the Hasselblad GPS accessory and other “smalls” (SD cards, microfiber cloth, Allen wrench, WhiBal, key ring flashlight). I also put in slots for a two circular polarizer filters (65mm and 77mm), the boxes for which sit 20mm proud of the surface. This is the design app working palette showing placement of each item on the grid (the grid spacing in this illustration is different from the spacing I used during the design process only because I wanted the grid to be more visible for this article). The pink/salmon areas show where the cutouts are on the back side. The yellow border is a “warning stripe” to prevent the design from getting too close to the edge of the foam. My design encroached into the warning stripe somewhat. That proved to be no problem because of the density of the foam I chose. More about that later. As cutouts are added, you can review what the finished design will look like using the 3D rendering feature of the design app. This feature is helpful to determine whether cutouts overlap or are too deep, are positioned too close to the cutouts on the back side (for the case handles and wheels), or whether complex cutouts have voids that need to be corrected in the design. The reason for some of the cutout placement in my design has to do with the wheel and handle recesses on the back side of the foam. 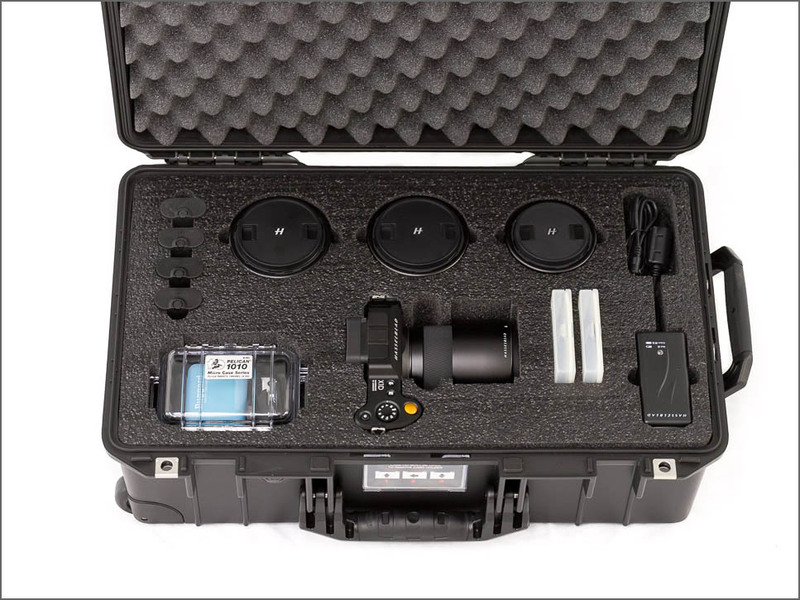 The recesses dictate placement of shallow items (batteries, charger and cord, small plastic Pelican case) at the ends to make the most of the surface area and usable foam depth. I chose the Polyethylene (PE) foam for this project because of the weight of the XCD lenses and my desire to minimize equipment movement during travel. The PE foam is a more rigid foam than the Ester foam and is less likely to shed or peel with heavy use. Once the design is submitted, fabrication time is estimated to be 10-12 business days depending upon order backlog. My foam insert was shipped within the estimated window and arrived well packaged and [almost] as designed. OK, the above photos show my second attempt. Fortunately, I purchased Failsafe Design Protection and took advantage of the one “do-over” offered by this option. Failsafe Design Protection is cheap (~$12) and provides one “revision and refabrication of your original foam design”. 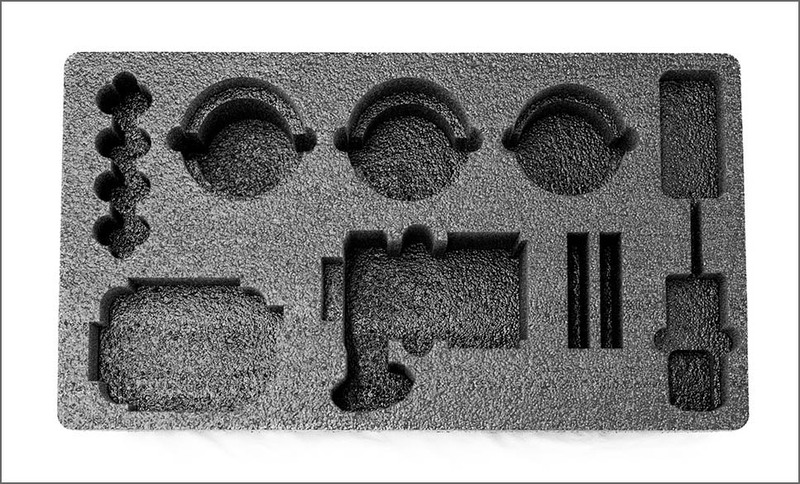 The first completed foam insert had several problems resulting from poor design choices and an inadequate understanding of the limitations of the fabrication process. 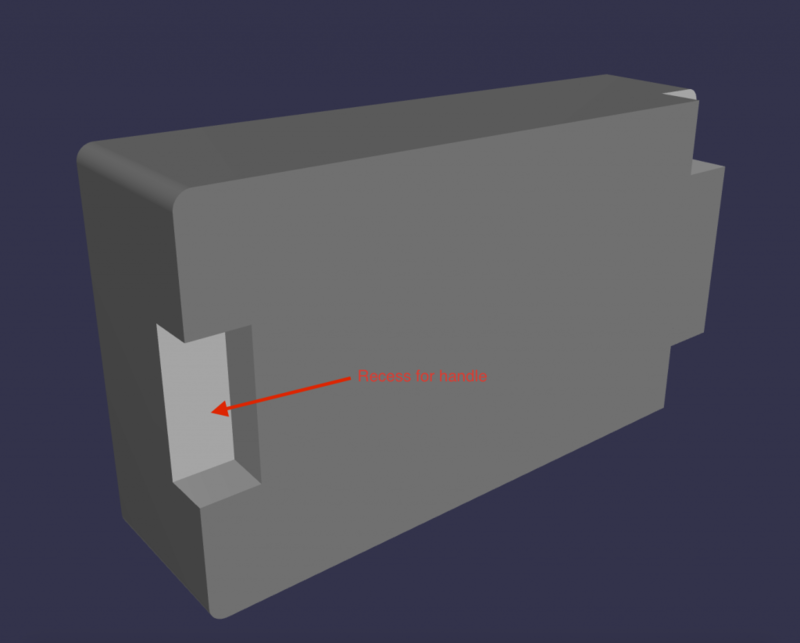 After I submitted my initial design, MyCaseBuilder customer service called to point out some design elements that would be difficult to fabricate and suggested changes. Even with that help, the first iteration had a few problems. It was usable, but [for a perfectionist] wasn’t good enough. The do-over was perfect. This entry was posted in Uncategorized and tagged Hasselblad, Medium Format, MyCaseBuilder, Other, Pelican, Photography, X1D, X1D-50c.